http://www.jewishworldreview.com -- IN the pantheon of American Jewish heroes, Haym Salomon (1740-1785) has attained legendary status. His life was brief and tumultuous, but his impact on the American imagination was great. The U.S. Postal Service issued a stamp hailing Salomon as a "Financial Hero of the American Revolution." A monument to Salomon, George Washington and Robert Morris graces East Wacker Drive in Chicago and Beverly Hills, California, is home to an organization called the American Jewish Patriots and Friends of Haym Salomon. However, Salomon's life was not all triumph. A successful financier in the early 1780s, he died in 1785 leaving a wife and four young children with debts larger than his estate. When his son petitioned Congress to recover money he claimed his father was owed by the government, various committees refused to recognize the family's claims. In 1936, Congress did vote to erect a monument to Salomon in the District of Columbia, but funds for the actual construction were never appropriated. Born in Lissa, Poland, in 1740, Salomon spent several years moving around western Europe and England, developing fluency in several languages that served him well for the remainder of his life. Reaching New York City in 1772, he swiftly established himself as a successful merchant and dealer in foreign securities. Striking up an acquaintance with Alexander MacDougall, leader of the New York Sons of Liberty, Salomon became active in the patriot cause. When war broke out in 1776, Salomon got a contract to supply American troops in central New York. In 1777, he married Rachel Franks, whose brother Isaac was a lieutenant colonel on George Washington's staff. Their ketubah resides at the American Jewish Historical Society. In the wake of a fire that destroyed much of New York City, British occupation forces arrested and imprisoned Salomon. He gained release because the British hoped to use his language skills to communicate with their German mercenaries. Instead, Salomon covertly encouraged the Hessians to desert. Arrested again in early 1778, Salomon had his property confiscated. A drum-head court martial sentenced him to hang. 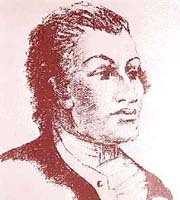 Salomon escaped – probably with the help of other Sons of Liberty – and fled penniless to Philadelphia. His wife and child joined him soon afterward. In Philadelphia, Salomon resumed his brokerage business. The French Minister appointed him paymaster general of the French forces fighting for the American cause. The Dutch, and Spanish governments also engaged him to sell the securities that supported their loans to the Continental Congress. In 1781, Congress established the Office of Finance to save the United States from fiscal ruin. Salomon allied himself with Superintendent of Finance William Morris and became one of the most effective brokers of bills of exchange to meet federal government expenses. Salomon also personally advanced funds to members of the Continental Congress and other federal officers, charging interest and commissions well below the market rates. James Madison confessed that "I have for some time ... been a pensioner on the favor of Haym Salomon, a Jew broker." While supporting the national cause, Salomon also played a prominent role in the Philadelphia and national Jewish community affairs. He served as a member of he governing council of Philadelphia's Congregation Mikveh Israel. He was treasurer of Philadelphia's society for indigent travelers, and participated in the nation's first known rabbinic court of arbitration. Salomon helped lead the successful fight to repeal the test oath which barred Jews and other non-Christians from holding public office in Pennsylvania. He operated within the context of a society, and an age, that considered all Jews as Shylocks and money grubbers. In 1784, writing as "A Jew Broker,' Salomon protested charges that Jewish merchants were profiteering. Salomon thought it unjust that such charges were "cast so indiscriminately on the Jews of this city at large . . . for the faults of a few." His impassioned defense of his fellow Jews brought him national approbation. Within five years of his arrival in Philadelphia, Salomon advanced from penniless fugitive to respected businessman, philanthropist and defender of his people. He risked his fortune, pledged his good name and credit on behalf of the Revolution, and stood up for religious liberty. Despite financial setbacks at the end of his life, Salomon's name is forever linked to the idealism and success of the American Revolution, and to the contributions Jews have made to the cause of American freedom. Michael Feldberg is the director of the American Jewish Historical Society. Comment on this article by clicking here.